I wore this outfit a few weeks back. I think I had 3 shoots scheduled that day so I wanted to wear something comfortable. 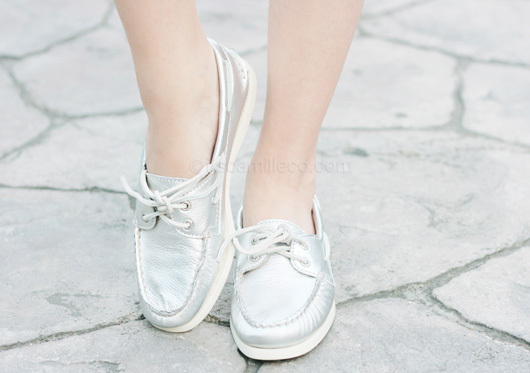 And since I was going for comfort, what’s more comfortable than these boat shoes from Sperry Top-Sider? I love that they have them in silver now, instead of just the usual colors. You can find more Sperry Top-siders at Complex Lifestyle Store located at Eastwood Mall, Hideout at Greenbelt 5 and Shoe Salon. P.S. The Mango It Girl x Lookbook contest isn’t over yet. You can still help me and hype my looks until the 24th, using either your Facebook or Lookbook account. Hype my looks here, here, here, here and here. I’ll be forever grateful!